Doug was great to work with on the kitchen remodel. His approach is very consultative to assist you in designing your dream kitchen. He did the kitchen design and made recommendations on the entire first floor plan. The cabinets are fabulous! Old world craftsmanship at affordable prices. We chose inset doors which really showcase the cabinet design. I definitely recommend you talk to Doug Wampler about your cabinet needs. We brought in Doug to build us a bar. We didn’t really know what we wanted at first but found a picture online of our idea of a perfect setup. We gave the picture to Doug and he went and created some drawings/plans. It all looked great and away he went at creating. We could not have been more happy with what we received. Doug was there at every turn to answer questions and recommend other subs for things like electrical and tile whom all were very professional. I think the item that impressed us the most was the attention to detail and that what Doug was creating was being accomplished as if it were his own. You could go somewhere else for custom woodworking, but why. Finest carpentry work you could ask. Excellent craftsmanship and service. Wampler designed and built custom desk, kitchen table, and other custom work in my house which are exacting and right to my specifications. We found Doug’s profile on Houzz with a picture of a kitchen we liked. Our contractor knew him and highly recommended him. Doug is professional, takes the time to ask what you want, and makes you think about design and function. He listens to new ideas and comes back with updated drawings. He uses every inch of your space efficiently. We wanted a more casual cabin style, and he talked about the wood grain, the stain, finishing touches. The cabinets are incredible, the layout is perfect. He worked on our master bathroom first, and then we hired him for the kitchen cabinetry. We recommended him to our friends and they were also very pleased. Doug takes great pride in his craftsmanship and is very easy to work with. A friend recommended Doug Wampler for my library project. He listened to my requests and reviewed the pictures I had collected before creating his detailed plan for the library. Doug’s cabinet design is the focal point that I wanted to create in this room. His attention to detail in the woodwork and trim was exceptional. Doug is a master craftsman. His unique abilities make him the perfect choice for custom cabinets and furniture. Our cabinets are beautiful, just perfect! 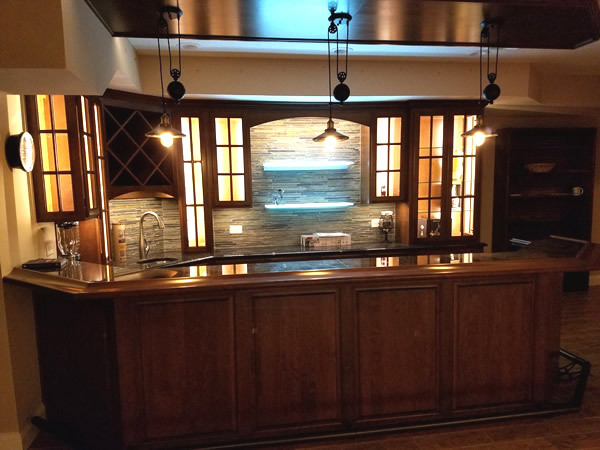 Doug Wampler was recommended to us by a family member who had him design and build her kitchen cabinets in their new house. We loved what we saw and hired him to do the cabinets in our kitchen remodel. Working with Doug on designing our kitchen cabinets was a pleasure from start to finish. He was a consummate professional. He listened carefully to what we wanted and to our ideas. He offered suggestions and often came up with ideas or another way of doing or looking at things that had not occurred to us. Doug is a craftsman and a perfectionist. Nothing was ever “good enough”, it had to be “just right”. He met timelines and worked easily with our contractor. Doug gave us a cost when we first began the project. When I asked for changes or addition, Doug always gave us the cost of that change or addition. We appreciated that and knew exactly what we would pay at the end of the project. No surprises! We had interviewed other companies prior to hiring Doug and found that Doug’s cost was reasonable and in line (or less) than others. Our cabinets are beautiful, just perfect! Everyone, including other professionals, ask about our cabinets and remark on how beautiful they are. We have recommended Doug to others and he recently did the cabinets in our son’s kitchen remodel. They, too, are very happy with his work. As you can see, I am extremely happy with, and impressed with, Doug’s work and recommend him wholeheartedly to all. I first worked with Ron Wampler and his son Doug Wampler on a project at my former home in the Historic Oregon District in Dayton, Ohio almost 15 years ago. As a house-warming gift, my in-laws gave us an enormous, freestanding bookcase that Ron would build to fill a wall almost eleven feet high. Upon installation, Ron carefully cut away the baseboard to precisely house the base of the bookcase and securely anchored the piece to the wall. Everyone thought it was a built-in, original to the house, especially because Ron had mirrored the crown molding design elements of the home into the finished product. Shortly thereafter Ron built a storm door for the front door of the same home, and because there are no 90 degree angles in a home built in 1850 that survived Dayton’s Great Flood of 1913, it was no easy task. Both pieces are gorgeous. Flash forward to plans for our new home and the Wamplers are relocating our giant bookcase on the back of their pickup truck with tender loving care to their shop. I asked Doug to re-design the crown molding to reflect the modern aesthetic of our *new* 1955 mid century modern split level, reposition the door pulls to center, replace with modern pulls we found in the house to match those on original built-ins, and repaint to match said built-ins. He borrowed a cabinet door from the built-ins to get the perfect color match and … DONE. Gorgeous again. We introduced our architect to Doug Wampler and together we have remodeled up a storm, designing a modern kitchenette where a laundry facility once stood, bathroom cabinetry galore, and a stairway guardrail and banister of such beauty and refinement, it is as if it were born to this house, all with a stunning recurring design element of laminated Baltic birch. Doug restored the front door of our home to its original beauty, built a freestanding locker storage cabinet for the kids, and refurbished more than one piece of vintage furniture for us. He is literally ‘on call’ when cabinetry questions arise, and they do! R.E. 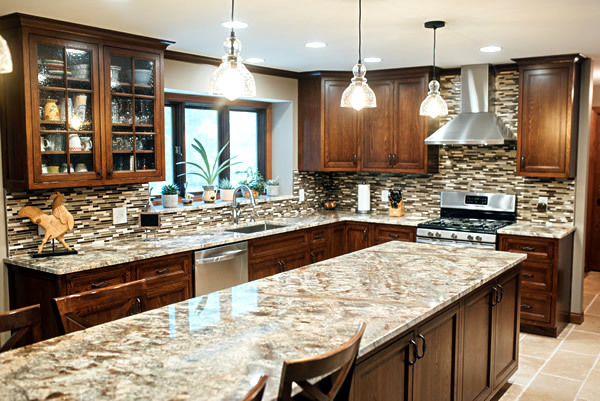 Wampler & Son is a Master Cabinetry operation with any member of this wonderful family answering the phone when you call the house or the shop, which is a shout across the Wampler’s driveway. We’d love to know how you feel about working with R.E. Wampler & Son. Please take a minute to tell us all about it. Use the convenient form on the right, and don’t be shy! You’ll have all the room you need for your comments. Thank you, and we appreciate the trust you placed in us to help you create your dream project.